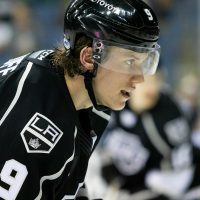 In what has become one of our most-viewed series of articles over the past few years, it is time once again for a new edition of the LA Kings Top 10 Prospect Rankings. The content provided here has become almost the bible of prospect information, as we share all the latest thinking on the team’s top crop of future hopefuls. Nobody (well, nobody who doesn’t report to Dean Lombardi) talks to more coaches, scouts, General Managers, peers, etc. about the Kings prospects on a regular basis than MayorsManor. For those new to the party, it was right here in 2011 where we gave you Martin Jones and Jake Muzzin as the team’s top two prospects – ahead of more heralded guys like Andrei Loktionov and first round pick Thomas Hickey. We also had Tyler Toffoli as the top forward prospect on our list that same year. Coming out of the 2012 lockout, MayorsManor listed Toffoli and Tanner Pearson as the team’s top two overall prospects. Neither had played a single regular season NHL game at that point, yet those questioning our high praise for the pair back then have all but disappeared now. In short, our rankings are carefully culled together after hundreds of hours of watching, talking and debating the team’s prospects with a myriad of well-respected hockey people, including our key sources inside the Kings organization. Patrik Bartosak, goaltender – Of all the guys mentioned here, he is perhaps the one closest to cracking the Top 10. After being passed over in the 2012 draft, largely because he missed the entire second-half of the season with a shoulder injury, Bartosak went on to be named junior hockey’s Goalie of the Year one year later. Los Angeles then selected him in the 5th round (146th overall) coming off his stellar campaign with the WHL’s Red Deer Rebels. Already holding a three-year Entry Level Contract, Bartosak will open this season in Manchester with a split-duty role, but is looking to be the No. 1 guy by Christmas. In a feature story I did on Bartosak for LAKings.com earlier this year, Kim Dillabaugh, one of the Kings’ two goalie whisperers, noted, “He has a lot of characteristics and assets that we believe are necessary to be the lead goaltender.” The 21-year-old netminder doesn’t simply have his NHL dreams in mind though; he told us he’s also set a goal of becoming the starter for the Czech Republic at the next Winter Olympics. In his brief four-game stint with the Monarchs at the end of last season, Bartosak posted a 3-1 record with a 1.75 goals against average and .941 save percentage. That came after playing 65 games in the WHL, where he put up a .924 save percentage. J.F. Berube, goaltender – After Martin Jones was called up to Los Angeles in mid-season, Berube took over as the No. 1 guy in Manchester; and it was a job he certainly earned the hard way. As Dillabaugh mentioned in a feature story I did on Berube for LAKings.com, “[J.F.] has been a guy that’s had to travel a different road [than say] Jonathan Bernier… He was a guy that had to pay his dues.” Taken in the fourth round of the 2009 NHL Draft, Berube was dominant at the QMJHL and ECHL levels. Further, last season’s first round playoff exit by Manchester can’t be laid at the crease of the 23-year-old netminder considering his .936 save percentage and 1.67 GAA during the AHL post-season. As noted in the past, when he’s focused, he’s been as good as any other goalie the Kings have had at the same age over the past 10 years. He enters this season as the Monarchs starting goalie, but will be heavily challenged by Bartosak. In that same article linked above, Dillabaugh also said, “[Berube has] that swagger and that belief that he can come out and be a consistent performer and a number one goaltender in the American Hockey League… He hasn’t let adversity affect him, he’s used it as motivation. He’s always believed in himself and we’ve always believed in him, as well.” This is going to be a very interesting season for him. Nick Ebert, defenseman – If former Kings defenseman Mark Hardy was the lone voice in determining our rankings, Ebert would be in the Top 10. The player-turned coach loves what Ebert brings to the table. However, after an impressive camp this year, one Kings executive may have put it best when he cautioned against getting too excited in the current “flavor of the month” among the prospects. It’s not a slam on Ebert, it’s just a reminder to pump the brakes a bit. While some people are quick to point out he was taken in the seventh round of the NHL Draft, they usually fail to also mention that just a year earlier, some scouting services had him ranked as a probable first round pick. Ebert brings a heavy shot from the point and can dazzle you with the puck. After playing with the Guelph Storm (OHL) and a brief stint with the Ontario Reign (ECHL), Ebert will face his biggest test yet, patrolling the Monarchs blueline this season. If he can have another breakout year, he most surely will crack the Top 10. For now, his size (thickness, not height) and strength remain two of his biggest assets, as he has a leg up on many of the team’s other defensemen in these areas. The comment most often heard regarding Ebert is that his hockey sense will need to improve in order for him to have a legitimate shot at becoming a NHL roster hopeful. Kevin Gravel, defenseman – He has quickly become the most polarizing prospect in the organization; and we’re not really sure exactly why. He has the size (6-foot-4) they like, co-captained his team last season, was arguably the best player on Team USA at the World Junior Championship, and his improved dramatically since being drafted in the fifth round back in 2010. Further, in my feature story on Gravel for LAKings.com last season, Rob Scuderi (the college version, who had less grit than he did as a Stanley Cup winner in 2012) was being used as a comparable when we spoke with people inside the Kings front office. During his first three years at St. Cloud State, he dramatically closed the gap between himself and first round pick Derek Forbort. 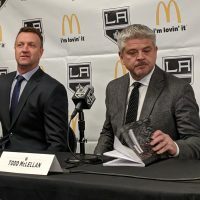 “He was so ahead of schedule, it looked like we hit a homerun,” one Kings executive recently told MayorsManor. Then, last year, things changed, with the Kings now saying they want to see more “compete” from the kid. He needs to “work harder and more consistently.” He’s still so close though, as we were told if Gravel takes one more step up the compete ladder, he’s going to earn an NHL contract. And if takes just two steps up the compete ladder, he’ll be considered a bona fide NHL prospect. If he starts the year in Ontario, it’s going to be such a bummer that Hardy won’t be there to help him. We’ll be watching closely when he plays in Manchester. Seeing him and Forbort on the same team for an extended period should provide some answers to the many questions that have developed since their draft year. Zac Leslie, defenseman – In the first half of last season, Leslie was as good as any defenseman in the OHL – and that’s really saying something. Unfortunately, by the time the Guelph Storm reached the Memorial Cup, he was gassed. He’s still probably a year away from challenging for a spot in the Top 10. However, he’s also one of the most important prospects in the organization because of what they hope he can become. Willie Mitchell was the perfect hybrid defenseman for the Kings system. Now, they have Jake Muzzin and would really like to groom another. Leslie is one of three candidates (along with Paul LaDue, and possibly Roland McKeown) who could potentially fill that role. Leslie dazzled the team’s development guys at camp, but he’s 15-20 pounds too light. He sees the ice very well, and competes extremely hard. A final decision hasn’t been reached yet – regarding whether he’ll play in the AHL or OHL this season – but, we’re told he would need to play his way off Monarchs roster in camp, not play his way onto it. Regardless, he’ll need another strong year to continue moving up the rankings. 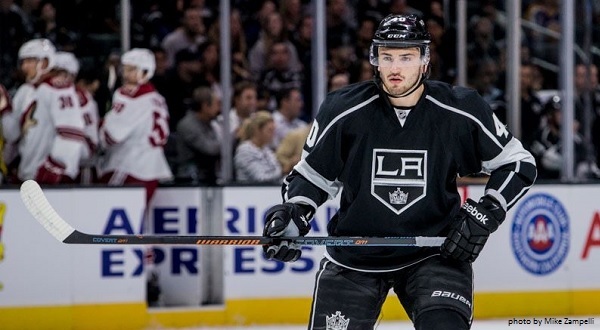 Roland McKeown, defenseman – He has already emerged as the x-factor among the Kings top defensive prospects, as there are many questions surrounding where McKeown’s development goes from here. He will first need to buy into the fact he won’t be a top pairing defenseman in the NHL before truly unlocking his potential. “The weird thing is, his tools are among the best when compared with all other prospects. It’s how he employs those tools,” said one scout. The good news is, he’s only 18 years old, so he’ll have several years to figure it out. At this point, McKeown will most likely need two more years of junior hockey and then two years of AHL structure / experience before being NHL ready. Thing can change quickly with young players though, so don’t be surprised if the commentary is different 12 months from now. Drafted with the pick acquired from Vancouver, in exchange for Linden Vey, McKeown fits the mold of the team’s interest in well-rounded players. However, his game lacks definition, which may have been a reason he slipped from being a perceived first rounder to a player drafted in the middle of the second round. Still, he was a heavy minutes-eater for Kingston last year, playing in all scenarios, including the power play and penalty kill. 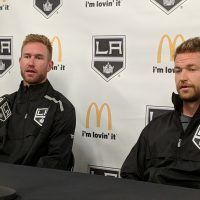 In a MayorsManor interview live from the Draft this year, head scout Mark Yannetti, explained why the Kings traded up to take McKeown. Nikolay Prokhorkin, forward – If you’ve been reading MayorsManor for any real length of time, you likely know there have been few prospects as interesting off the ice to follow over the past few seasons as Prokhorkin. 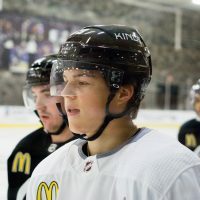 After signing an NHL contract with the Kings two seasons ago, a KHL dispute forced him to return to his homeland of Russia to fulfill the three seasons he still had left on his contract – something the Kings organization fought against, before eventually relenting. Following a disappointing 2012-13 season, where the youngster struggled to find ice time and left some wondering if his progress would stagnate the way it did for Max Kitsyn, this past year was a coming out party for Prokhorkin. The 22-year-old forward led his CSKA team in points, a team that includes members Alexander Radulov and former King Alex Frolov. Since the conclusion of the season, conflicting reports came out about where Prokhorkin would play this coming season, after he attempted to buy-out the final year of his KHL deal. Eventually, the youngster decided to re-negotiate his contract and stay in Russia for one last season. A player who uses his body effectively and has great offensive potential, Porky, as he’s known, fits the mold of players the Kings are looking for. Even as a teenager, the kid was willing to stand up and fight for his teammates if the situation called for it. One of the more interesting things to keep your eyes on is the position Prokhorkin will play at the next level. He has on the record stated he prefers to play center, but he would more likely be a winger with the Kings. Still, the question of ‘When will he come back?’ has slowly turned into a giant ‘If he comes back…’ After being high on him at one point, it seems the worm may be turning inside the Kings front office, as well. There is a growing sense that those outside the team overvalue Prokhorkin as a prospect. Like we’ve said in the past, despite his impressive offensive output, we’re just not ready to put him in the Top 10 until he’s back in North America and there’s a clear development plan in place. Part two in this series will take an in-depth look at the Kings prospects ranked No. 6-10, then we’ll conclude later in the week with the always anticipated unveiling of numbers 1-5. In the meantime, check out the linked articles below for more information on some of the Kings prospects. UPDATE: The full Top 10 rankings are now up here.